YWAM Lichinga has many different ministries in the city as well as in the surrounding villages. Here is a snapshot of what we are doing in our city to know God and make Him known. Just outside the city is the YWAM training center. It consists of a large house, a block with 8 rooms, two blocks of four two-bedroom apartments and a classroom / meeting room. Furthermore, a well, two outdoor toilets, a kitchen and construction container. In the future, we hope to add more apartments, a few more classrooms for adults, and a children's classroom. This is the place where YWAM schools take place. Every year we organize a Discipleship Training School (DTS). It is our vision to organize other schools as well. The DTS is a Christian training of five months. The first three months is lecture phase followed by three months of outreach: a field trip. The focus of the DTS is: to know God and make Him known. The DTS allows you to totally focus on Jesus. Throughout the DTS you will learn how you can grow in your intimacy with God, develop your character, find your place missions and learn how you can reach out to others. It's not just information, but change. Not just heads full of knowledge, but hearts full of faith that your hands reaching out to others. In the future we also start other YWAM schools at the training center. A Community Development School (Community Development), an Introduction to Primary Health Care School (health) and a School of Biblical Studies (Bible study). We also monitor the training center of our team meetings and seminars. 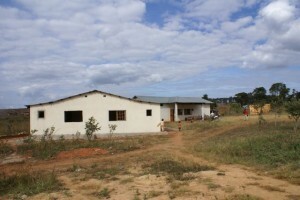 Our training center is a vital part of what we do here in Lichinga. As a staff, we have a huge vision for how God wants to equip and train this province and beyond. We believe that Niassa can become known as a Christian province through this ministry. 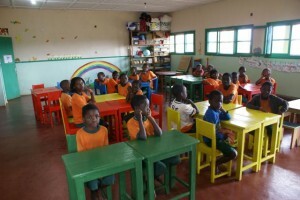 We started a pre-school and primary school in one of the poorest districts in Lichinga. What began as a class of 15 pre-schoolers is now a school with six classes and 124 children, a number that is growing every year. The differences between American and Mozambican primary school education are quite shocking. I can best explain by giving an example. Imagine that you are a boy of 7 years old and lives in Mozambique. Your parents wanted to send you to school last year, but there was no place, so this year you go to school for the first time. You come into a room where there are 90 other kids sitting on the cold concrete floor. The teacher walks in and begins speak Portuguese, but in your home they speak a different language (tribal language), so you don't understand anything the teacher is saying. You have not eaten that morning, because there is not much food in the house, so focus is hard enough, but with the foreign language the teacher is speaking, learning has become almost impossible. When a classmate asks a question, the teacher yells at him, so it looks like you'd better keep your mouth shut. The teacher probably doesn't have more than a 8th grade education, anyhow. The only thing in the classroom is a blackboard. Some children have a book, but most do not. There is no paper or pencils in the classroom. If you are lucky enough to have brought some paper to school, you copy what has been written on the board. However, you cannot read it and no one teaches you how to read it. After 3 hours, you are sent home to come and do the exact same thing the next day. The YWAM school is happily very different. This school has a dedicated team of teachers and teachers who guide the children with love and attention during their school years. Through sponsorship, each school child, there is material (books, notebooks, pencils, crayons, etc.) for each child. The teachers are creative. Because there is a maximum of 25 children per class, teachers are allowed to give time and attention to the development of each child. The school is located in one of the poorest areas of the city because we want to give these children a chance. Mitava is a village about 20 outside. As in almost all villages of Niassa is also Mitava 99% of the Muslim population. Since the average life expectancy is 42 years, it is especially when people are older than 70. Islam is mixed here with animism and belief in various demons and so the older people are often branded as witches. Many believe that you must practice some kind of demonic magic to become so old. The family often sends the old person away to fend for himself.But God also loves older people, for him they actually count them. 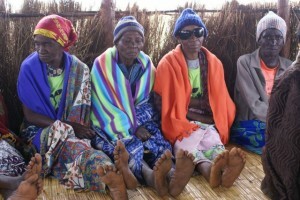 The YWAM team there, led by Antonio Mafunga, began a work among the elderly of Mitava. The team provides pastoral care, does home visits, helps with medical problems, does Bible study with them, and they have a feeding program. The families of the elderly are beginning to value them again. Itepela is a large village 60 miles south of Lichinga and totally 'in the bush.' It is home to approximately 4,000 people. In the past, an outreach team of the DTS (Discipleship Training School) visited this village and evangelized there. That was the beginning of the change. Before the team arrived, the head of this (100% Muslim) had a dream where God told him that white people would come and they would bring light. God told him his village should listen to what these people had to say. When the DTS team came, God had already prepared the village for their visit! The people were very open and the head of Itepela even asked the team to live with them so they could learn about God. Later the head of this village gave his heart to Jesus and testified in all openness to the Muslim leaders with the following beautiful words:"You can not see my heart, but if I could take it out of my body and could lay down for you, would you Jesus see you there! " The team that currently resides in Itepela:. 3 couples with children and one single lady, and Aldenice Pedro. Pedro is a carpenter and has taught several villagers this skill. As he teaches them how to work, Pedro testifies about Jesus and has several people he is discipling. They have started a church among the new Yao believers and the young church writes worship songs in their tribal language: Ciyawo. The biggest health problem of malaria is Itepela. Geraldo has a completed a Primary Health Care (IPHC) school and has had training in the use of the microscope. In 2009, YWAM opened a laboratory in which Geraldo tests for malaria and for HIV/AIDS. The local chiefs and government were very happy, because Itepela is the first village to have such a laboratory . The few other laboratories in Mozambique are only in the capitals. The government has invitedYWAM to launch this initiative in more villages because it is literally life-saving. In Itepela, the mortality rate has fallen significantly since 2009. We pray that God will bring us people with the vision to do this! Change started in Itepela! Where Itepela was 100% Muslim first, people now make the choice to follow Jesus. That is the greatest blessing we can think of!